UPDATED: The Texas Commission on Environmental Quality has approved the permit for construction of North Texas' Lake Ralph Hall, the first major new reservoir built in the state in decades. The Texas Commission on Environmental Quality has approved the permit for construction of North Texas' Lake Ralph Hall, the first major new reservoir to be built in the state in decades. In a statement, the National Wildlife Federation expressed its disappointment, claiming the agency had "missed a golden opportunity to advance water conservation in Texas." The project now awaits approval from the Army Corps of Engineers, which will focus on the lake's potential impact on natural resources. The future of North Texas' water supply could hinge on Tuesday. 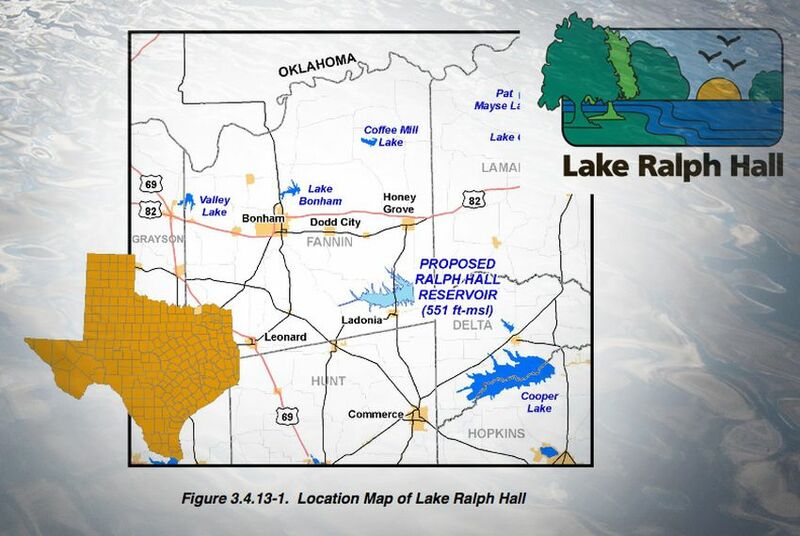 That's when the Texas Commission on Environmental Quality is set to decide the fate of Lake Ralph Hall, a proposed reservoir 80 miles northeast of Dallas that would be the first large one built in the state in more than two decades. The Upper Trinity Regional Water District, the water wholesaler that serves the fast-growing part of North Texas that includes Denton County, has been trying to get approval to build the water source since 2003. A flurry of editorials published across the Dallas-Fort Worth region have called for the TCEQ to approve the lake, which the local water district says would supply 30 million gallons a day to its customers. But the proposal has fierce critics among environmentalists, who say the water provider needs to do more to promote conservation. And some North Texas residents have big concerns, too. Flower Mound customers account for about 40 percent of the Upper Trinity Regional Water District’s revenue. Some of their water also comes from the city of Dallas, which Mathews said the town would prefer to tap for future water supplies since its rates are far cheaper. The water district’s second-largest customer, the city of Corinth, also opposes Lake Ralph Hall. But most other communities in the region strongly support the project. The water district says that by 2025, fast-growing Denton County won't have enough water. Officials hope to begin construction on the proposed 11,000-acre reservoir in 2018 and finish it by 2023. The water would come online two years later. The lake is one of 26 new large reservoirs that state waters planners envision over the next 50 years, which could cost an estimated $14 billion combined. It’s unlikely they will all be built. But observers will closely watch the TCEQ’s decision on Tuesday, as it could signal how the agency might act on future projects — including North Texas' Marvin Nichols reservoir, a controversial proposal with a $3.4 billion pricetag. Should voters approve November’s constitutional amendment to spend $1.1 billion on water projects around the state, many hope some of those dollars would build new reservoirs. The Texas Water Development Board, which would oversee allocation of those funds, has already set aside $21 million for Lake Ralph Hall. But environmentalists have long argued that North Texas needs to do a better job of conserving water before breaking the bank with multimillion-dollar reservoir projects. Myron Hess, who manages the Texas Water Program in the Austin office of the National Wildlife Federation, said the state should ask the Upper Trinity Regional Water District to improve its water conservation plan before approving Lake Ralph Hall. The district says a good portion of its existing water supply already comes from water reuse, which will only increase if Lake Ralph Hall and associated reuse projects are constructed. Even if TCEQ approves Lake Ralph Hall, there’s still another hurdle to clear: The federal Army Corps of Engineers must approve a permit for the project, too. And the project would not solve North Texas’ water woes. While it would provide more than 10 billion gallons a year for the Upper Trinity Regional Water District’s customers, that is not even one-10th of what the area surrounding the lake is projected to need by 2060.